Easter Day was an appropriate day for me to resurrect myself from the surgical knee business. And so it came to pass. Because of several health issues that beleaguered us recently, my family decided to forego the work and stress of a house-bound dinner and celebrate Easter together at the brunch at Gatherings at the Senator’s Mansion. What a brilliant decision! Chris and Lisa Steubing, owners of Gatherings as well as the Daisy Flour Mill, run a well-oiled, elegant, and simply scrumptious organization there. (At both places, actually.) 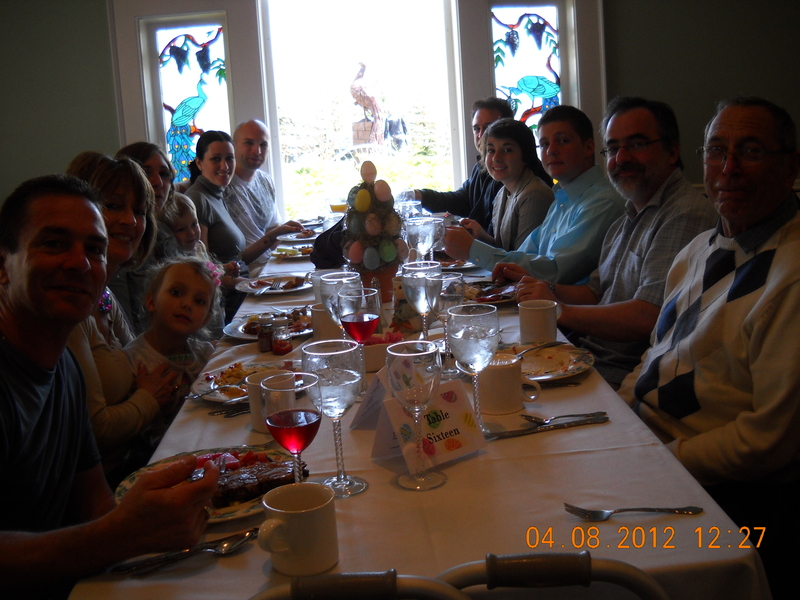 Our seating (for 12 adults and two toddlers) was reserved for 1:00 p.m. And, of course, we were seated at 1:00 p.m. Spotless white linen tablecloths, adorned with deep purple napkins, spring flowers, and Easter decorations welcomed us. Our window looked out to a hand-carved wooden peacock, done by Chris Steubing, I believe, and a promising flower garden just beyond it. His forsythia and hyacinths were in full bloom and the color was glorious in yesterday’s bright sunshine. All this in a word, ambience! And then there was the food. OOoooooo, the food! Breakfast foods—bacon, sausages, scrambled eggs, stuffed pancakes, individually made omelets to your requests, were followed by luncheon/dinner selections: baked ham, stuffed pasta in buttery sauce, seafood (salmon, scallops, crab…) in a delicious sauce also, potatoes and so many different offerings I can’t remember them. There were long, fresh green beans that were fantastic, a Waldorf salad, sliced fresh fruit, pickled stuff… on and on. Off to one side, there were the roast beef and lamb stations with the attendant chef to carve yours exactly to your liking. The dessert tables are beyond description. Conjure your most delectable daydream and it will be there. Cheesecakes, chocolate death, cream delights, cookie bars of all kinds and descriptions, down to simple cinnamon bread rolls…all there to force painful decisions on your part. Normally, I would say the food is what it’s all about, but that isn’t the case for me here. Of course, the food is wonderful and plays a huge part in why I’m there, but it’s the Steubings who make the day for me. Chris and Lisa are always so warm and welcoming. I just walk in and they make me feel special. They’re such hard workers, as are their whole family. There are Steubings throughout the staff there, but you have to look fast! While making everyone feel taken care of, they (the staff) are buzzing here and there taking care of everyone. So, Easter was a huge coming out party for me this year. Thanks to my family for being there with me and thanks to the Steubing family for making me feel special. Love you Gram, wish we were there to enjoy Easter with you. I miss your egg hunts!!! Wyatt and Riley want their GG. I hope you are feeling better, we’re routing for a very speedy recovery. We should make up a holiday just for all of us: it could be Christmas, Easter, Thanksgiving, Mother’s Day, Father’s Day all wrapped into one. And we would ALL make a point of getting together at that one time. Chreather’s Day???? What’s a good month/// June? July? August?…..